Lawmakers rejected a cloture motion Jan. 10 during first-round debate on a bill that would repeal the state’s motorcycle helmet requirement. A cloture motion is an attempt to cease debate and immediately vote on a bill. Current state law requires motorcycle and moped riders to wear a protective helmet. LB368, introduced last session by Kearney Sen. John Lowe, instead would give riders 21 and older the option to wear no helmet but would require that eye protection be used. The bill also would prohibit children younger than six years of age from riding a motorcycle or moped. Lowe said 31 states already have repealed laws requiring all motorcyclists to wear a protective helmet. “It all starts with the freedom for adults to make their own choices and to decide what kind of risks they’re willing to accept for themselves,” he said. Crete Sen. Laura Ebke also spoke in favor of the measure, saying the Legislature should not assume it always knows what is best for people. 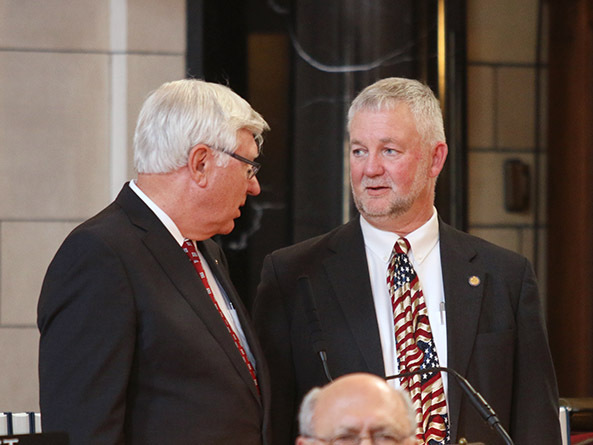 Gothenburg Sen. Matt Williams disagreed with that assessment, saying legislators are elected to make public policy that is best for all Nebraskans. Ultimately the social costs of traumatic motorcycle injuries outweighs the potential benefits that would be enjoyed by motorcyclists, he said. Any potential strain on state resources in the case of a traumatic motorcycle accident is a reasonable social cost to preserve citizens’ rights, said Sen. Dan Hughes of Venango. Sen. Robert Hilkemann of Omaha filed several amendments in an attempt to delay debate on LB368. He said an American Journal of Surgery study found that motorcyclists not wearing a helmet were more likely to die at the scene of an accident, spend more time in the intensive care unit and pay higher medical costs. Requiring motorcyclists to wear a helmet to prevent significant injuries is a small price to pay, Hilkemann said. After extended debate this week, Lowe offered a motion to invoke cloture on Jan. 10 and vote on the measure. The motion failed on a vote of 30-15. Thirty-three votes were needed. A failed cloture motion results in debate on a proposal ceasing for the day. LB368 is unlikely to be placed on the agenda again this session.